Thanks to Rob Carrick for a mention in his best-of-the-web roundup of my post It’s Time that Renting Got a Little Respect. The Blunt Bean Counter has reached the last installment of his series on how much money you need to retire and offers some dollar amounts. In another good post from The Blunt Bean Counter, he explains the bizarre situation where Canadians who hold foreign stocks in their non-registered accounts at Canadian brokerages have to give detailed reports on a T1135 form. I’m all for catching tax cheats, but why such onerous reporting rules for stocks held within Canada by one of our big banks or other well-known brokerages? Financial Crooks encounters some major T5 hassles with a joint PC Financial account. If you can believe it, she was asked to wait a month before calling again to try to correct things. That’s some amazing customer service. Big Cajun Man published a post explaining that the Canadian government will stop issuing physical cheques in a couple of years. It’s not clear what will happen to people who don’t have bank accounts. Perhaps this deadline is artificial and is just designed to get more people to sign up for direct deposit. Million Dollar Journey explains how construction mortgages work. (This is where you buy land and have a new home built.) It turns out that the bank doesn’t ever want to give you more money than the land and house are worth. So, you get money in stages based on how much the bank could recover in a foreclosure. My Own Advisor channels the Wealthy Barber with his advice on RRSP tax refunds. Canadian Couch Potato answers a reader question about how to find the optimal portfolio asset allocation percentages. Within reason, just about any allocation percentages can work out well if you stick to them. If you keep tinkering so that you’re a closet active investor, you may be headed for poor results. In another good post, Canadian Couch Potato shows how to work out the foreign withholding tax cost of ETFs holding foreign stocks. Fortunately, he works out all the details for many different ETFs. The Blunt Bean Counter has part 5 of his series on how much money you need to retire. My Own Advisor explains why he is keeping his 14-year old car. Big Cajun Man thinks that any income you have to declare on your taxes for bank account interest should be net of bank account fees. Million Dollar Journey shows how you can save money with instructions on doing your own snow blower maintenance. The point of my Double-Up GIC was to illustrate the tricky rules used in market-linked GICs by taking these rules to the extreme. The advertising of market-linked GICs makes it seem like you have a guarantee to get your money back if stocks fall and can get the market return if stocks rise. This isn’t the case. Market-linked GICs have rules that significantly reduce the return you get if the stock market goes up. The catch with my Double-Up GIC is that each of the 560 linked stocks must go up during all 60 months for you to get your full 100% return. Any excess return for a stock in a month above 0.00206% is wasted, but any drop in a stock counts fully. Across all the stocks there are a total of 560*60=33,600 monthly returns. If all the negative returns compound to a 50% loss, then these losses will completely cancel all the capped positive returns. So, if one-eighth of the stocks show a loss of 1% or more in the first month, you’re already guaranteed to get only your principal back and no added interest after the 5 years. So much for the dream of a double up. It would take quite a conspiracy to cause the markets to go up so consistently that this GIC pays any interest at all. If I had no empathy and sold such a GIC to some suckers, I would invest enough of their deposits in a 5-year stripped bond to cover the return of principal and invest the rest in two ETFs that cover the TSX 60 and S&P 500. This way I couldn’t lose on having to pay back the principal, and if stocks happen to perform so magnificently (perhaps due to runaway inflation) that I owe some interest after 5 years, my stock investment would most likely cover the interest I owe. Of course, the tricks the big banks use to limit interest payments aren’t this punishing, but you have to read through the fine print and do some math to see why market-linked GICs won’t give you much of the returns from stocks. Canada’s big banks all offer various types of market-linked Guaranteed Investment Certificates (GICs). The idea is that your principal is 100% guaranteed, and if the stock market performs well enough you get higher returns than standard GICs pay. It’s like you can have your cake and eat it too. However, the returns usually have a fairly low cap. I decided to design my own market-linked GIC that I’d be happy to offer to the public if it weren’t for two things1. My Double-Up GIC would offer the potential for a 100% gain over 5 years. The big banks tend to offer much lower maximum returns. The interest paid would be linked to the Canadian TSX 60 stocks and the U.S. S&P 500 stocks. However, even if stocks crash, investors’ principal would be 100% protected and would be paid back after 5 years. Here is the detailed calculation of the interest payment. In each of the 60 months we start with that month’s compounded share of the potential 100% gain (1.162%). Then we take the month’s returns of each of the 560 stocks and cap each stock’s return at its compounded share of the month’s maximum return (0.206 basis points) and then compound all the stock returns together. Then we compound together the 60 monthly returns to get your final 5-year return. If this final return is negative we move it up to zero; you never lose principal. A big advantage of the Double-Up GIC is that it uses compound interest rather than the simple interest calculation many of the big banks use to calculate your market-linked GIC returns. We all know that compound interest grows your money faster than simple interest. Another advantage is that my interest calculation is much simpler than the elaborate calculations some of the big banks use. Like other market-linked GICs, the Double-Up GIC strikes a balance between the bank’s desire for profits and investors’ desire for the appearance of safe access to stock-like returns. 1 Financial regulations and my ethics. Most people need financial advice. You don’t need much experience explaining financial matters to people to see that most need help. However, this doesn’t mean we can make the logical leap to saying that people need the services of a typical financial advisor. There is a huge gap between the financial advice people need and what they get from the typical advisor. The typical financial advisor will choose investments for you (usually high-fee mutual funds) and handle the mechanics of opening accounts and investing your money. While people need some guidance to choose an appropriate asset allocation, the truth is that opening accounts and choosing investments isn’t all that difficult. One option is to take a risk-tolerance quiz and choose one of Canadian Couch Potato’s model portfolios. 1. Should I invest in an RRSP, TFSA, RESP, or something else? 2. My advisor wants me to borrow to invest. Should I use leverage? 3. How can I pay my advisor fairly for his or her advice but keep other investment costs to a minimum? 4. The market just dropped 500 points! Should I sell? 5. The market has been climbing crazily lately! Should I buy more stocks? 6. Which accounts should hold my stocks and which should hold bonds? 7. When I retire, how much can I safely spend without running out of money when I’m old? 8. How should I organize my finances to reduce income taxes? There are great advisors out there who give good advice to their clients on these questions and more, but such advisors are in the minority. If you think the main job of a financial advisor is to choose investments, then you’ll likely pay a very high price for a fairly simple service. If you think the main job of an advisor is to help you outperform the market, then you’re very likely to be disappointed. Consistently beating the market is exceedingly difficult and an advisor who could really do it likely wouldn’t waste his or her time talking to you. If you’re going to pay for financial advice, make sure you’re getting the help you need on the difficult questions and not just a person who chooses expensive mutual funds. The 4% rule for retirement spending comes from a 1994 paper by financial planner William Bengen called Determining Withdrawal Rates Using Historical Data. Bengen showed that portfolios with 50% to 75% U.S. stocks and the rest in intermediate-term treasuries would last for 30+ years with yearly inflation-adjusted withdrawals of 4% of the starting portfolio value. However, Bengen assumed that you don’t pay any investment fees. 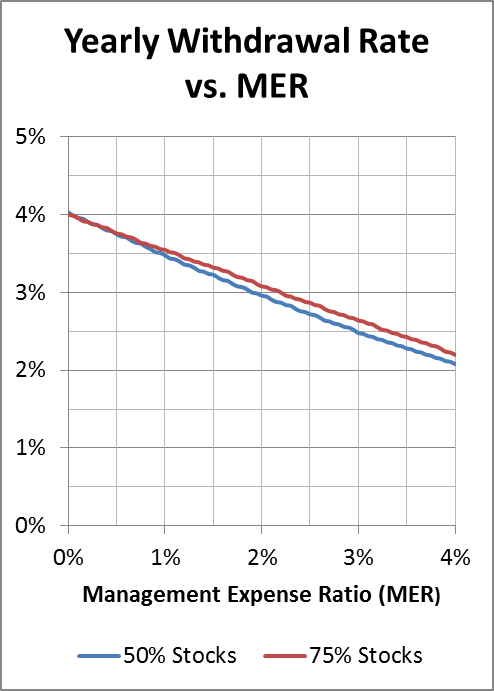 Here I replicate Bengen’s study and look at how fees affect the results. The retirement spending plan tested by Bengen differs from my ideas on Cushioned Retirement Investing in two main ways. With cushioning, you adapt your spending somewhat if investment returns severely disappoint, and the cushion leads to your portfolio volatility dropping through retirement. Bengen tested a strategy where you choose the withdrawal amount based on your portfolio size at the start of retirement. Once the withdrawal amount is set, you only adjust it for inflation. Bengen also assumes that you stick with a fixed asset allocation throughout retirement. So, if you have a million dollars at the start of retirement, the 4% rule says you get to spend $40,000 in the first year and bump that up by inflation every year. Bengen checked how this strategy performed for 51 retirees retiring each year from 1926 to 1976. The retirees were assumed to own U.S. stocks and intermediate-term treasuries in either a 75/25 or 50/50 ratio. I used Robert Shiller’s online data to replicate Bengen’s results. Shiller only had long-term bond data rather than intermediate-term, but I found it made little difference to the results. The number of years that each portfolio survived differed by a year or two from Bengen’s results in only a few places. Bengen found that with the 4% rule, all 51 retirees’ savings lasted for at least 30 years and only 5 of them lasted for less than 40 years. So, I used this as standard for what is acceptably safe. Running my simulation, the largest withdrawal that passed the acceptability test was 4.03% for the 50% stock portfolio, and 4.00% for the 75% stock portfolio. So far so good. The results match Bengen’s. Next, I introduced portfolio fees. For management expense ratios (MERs) ranging from 0% to 4%, I repeated the simulations to see what maximum withdrawal rate would pass the tests. You might think that the maximum withdrawal rate would simply be 4% minus the MER; this isn’t true because the MER is charged on an ever-declining portfolio size, but the 4% applies to the starting portfolio size. By the time the MER reaches 2.2% for a portfolio 75% in stocks, the 4% rule has become the 3% rule. You might think that using a 3% rule is just a more conservative approach, but this isn’t the case. Using a 3% rule with a 2.2% MER is just as risky as using the 4% rule with no portfolio costs (not that it’s possible to get away with no costs at all). If you blindly follow the 4% rule without understanding where it came from, you’ll likely end up running a much higher risk than you realized of running out of money later in retirement. Most of us believe that we should reduce the riskiness of our portfolios when we retire. However, there is little agreement on exactly how to do this. One common rule of thumb is to use your age as your percentage in bonds. However, such fixed rules just don’t take into account people’s unique circumstances. I prefer a technique I call Cushioned Retirement Investing to reduce risk. This technique is based on the simple principle that you shouldn’t invest money you’ll need in the next 5 years in risky investments. There is nothing magical about the 5-year threshold. More daring types may choose 3 years, and more conservative types may prefer 7 years. I’ll stick to the 5-year figure for this discussion. The main idea is that you keep any money you’ll need in the next 5 years out of the main part of your portfolio. Because the main part of your portfolio only holds funds that will be there for 5+ years, it can stick to your preferred asset allocation for your entire life. If you have a 75/25 split between stocks and bonds through your working life, you can keep the same allocation in retirement, as long as you maintain 5 years of living expenses safely off to the side. By “safely off to the side,” I mean something like a high-interest savings account (HISA), short-term government bonds, or guaranteed investments at a bank. However, any bonds or guaranteed investments have to come due before you need the money. If you’re using cushioned retirement investing, you’d need to make adjustments to start each year. First decide how much money you’ll need over the next 5 years (taking into account inflation). Because of your spending over the past year, you’ll likely have only about 4 years of spending set aside. So, you’ll have to gather some cash from your portfolio, which will likely require some selling. Once you’ve got a full 5 years of spending set aside again, you’re set for another year. The process of setting aside money actually starts well before retirement. When you’re 4 years away from retiring and you look at your needs over the next 5 years, you’ll need to set aside one year of spending somewhere safe. The following year, you’ll need to set aside another year of spending, and so on. Most of us have no grand plans for leaving a big inheritance and want to know how much we can spend in retirement. In a previous post I offered a spreadsheet that allows you to input information related to your situation and calculate the percentage of your portfolio you can spend each year. Keep in mind that the answers are only as good as the inputs you provide. There is also a page on the spreadsheet for doing the calculation in the other direction: figuring out how much you need to retire. Some might object that it makes no sense to maintain the same asset allocation into retirement. 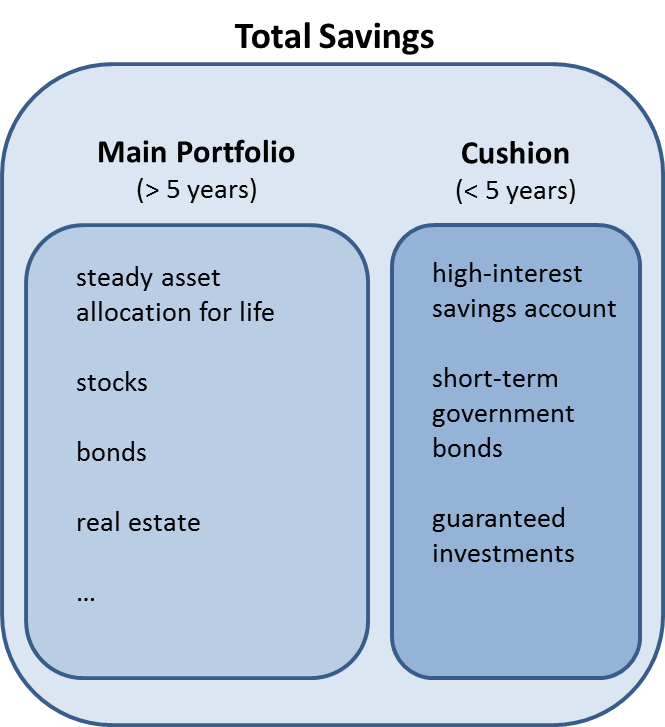 Keep in mind that it is only what I call the main portfolio (excluding the cushion) that maintains the same asset allocation into retirement. If we look at total savings including both the main portfolio and the cushion, things are different. In the 5 years leading up to retirement, the cushion builds. This lowers the volatility of the total savings. Further, as you draw down your main portfolio in retirement (as most people will), the cushion becomes a larger percentage of total savings, which lowers volatility further over time. Cushioned retirement investing isn’t just for people looking to maximize spending. It can apply equally well to those who intend to leave an inheritance. If you’ve got a $5 million portfolio, but only spend $80,000 per year, you could just keep aside $400,000 and invest the rest with an asset allocation suitable for the long term. In fact, the principles behind cushioned retirement investing can apply even before retirement. For example, they can be used for RESP investing. You could maintain your preferred asset allocation throughout the life of the RESP, except that starting 5 years before your children start post-secondary education, you begin setting aside some money in safe investments. The idea is that this safe money is still within the RESP until it gets spent, but you think of it as outside the main RESP holdings that are invested with your preferred asset allocation. We can even think of an emergency fund as an extension of the idea of a 5-year cushion. The emergency fund is money that you might need over the next 5 years in case you have unexpected expenses or lose some income. Cushioning can also apply to saving up for a house, cottage, or car. If you plan to buy in less than 5 years, the money should be kept safe. Overall, I prefer cushioned retirement investing to hand-wavy advice on how to adjust your asset allocation as you enter retirement. A side benefit is that the concept of cushioning is general enough to apply to many other aspects of financial life as well. I just found out that Chrome and Feedburner cannot handle square-root signs. I've updated the post to take them out. He was clever enough to figure out that making a trade every month might be too expensive, but if he waits too many months between trades, he’s giving up potential growth. There must be some optimum number of months between trades. Bid-ask spreads are a real cost, but they don’t enter into consideration because they are the same over the course of time no matter how often you trade. It’s time to trade when the cash balance reaches a threshold1 T equal to the square root of 2mc/r. I’ll do a few examples below to show how to use this formula. We’re assuming here that the opportunity cost rate r is constant. In reality, the opportunity cost can turn out to be just about any value depending on how stocks perform. But we can’t know in advance how they’ll perform, so we just use some assumed average rate. Another note about this formula is that it assumes that there will only be a single trade when the cash threshold is reached. It makes more sense to alternate among purchases of each ETF rather than to save up enough to make several purchases. In my son’s case, we assumed that the opportunity cost is 6% per year (r=0.06). He pays a $10 commission (c=10). Plugging these figures into the formula simplifies the threshold where you should make a trade to approximately 18 times the square root of m.
In my son’s case, m = 12*450 = 5400. Plugging this into the formula we get that he should make a trade when his balance reaches $1320. His balance will be $450, then $900, and then $1350. Because $1350 is closest to the $1320 we calculated, he would buy some VCN every third month to minimize costs. Let’s try another example. Suppose you receive $250 in dividends every quarter. Then m=1000. Using r=0.06 and c=10, we get a threshold of about $570. Your balance will be closest to this threshold every second quarter ($500). An aggressive saver puts away $500 on each bi-weekly pay cheque. So, m=13,000. Using r=0.06, and c=10, we get a threshold of $2050. So, it makes sense to trade every fourth pay cheque. Many investors will find it unsatisfying to let cash sit around while trying to optimize costs. It can certainly make sense to trade more often for emotional reasons. This is especially true if you are prone to spending the money if it’s just sitting there as cash. But for those interested in minimizing costs, this formula works well. 1 This formula is actually an approximation based on simple interest. If we use compound interest, we end up with equations that can only be solved numerically. It turns out that using simple interest gives a very close approximation, and there is little value in further precision. Let t be the time between trades. Then assuming that the yearly cash contribution m builds continuously, the cash balance will be mt when we trade. The average cash balance is mt/2. The foregone interest rate (using simple interest) is rt. The opportunity cost is then (mt/2)(rt). Add to this the commission cost c. We incur these costs 1/t times per year. Then the total yearly cost is mrt/2+c/t. This is a minimum when t is the square root of 2c/(mr). The threshold cash balance for trading T=mt is the square root of 2mc/r. The only difference when new cash comes in discrete amounts instead of continuously is that we should trade when the balance is closest to the threshold value T.